Perfectly fit for fitness applications, the XP106w can easily provide the power and performance needed to run small yoga classes and dance studios. The XP106w also excels in front of higher intensity exercise methods, including outdoor aerobics, Zumba and CrossFit. Use the Bluetooth or 1/8" stereo Aux (MP3 player) channels to engage your favorite workout playlists, or pick up the wireless mic to provide you class with words of encouragement and motivation. 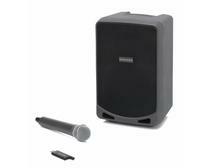 High quality components, versatile features, convenient portability and Samson's commitment to premium sound makes Samson's Expedition XP106w a consummate single system solution for a wide range of public address applications.